A section of the Guest & Chrimes building in Rotherham is being demolished for safety reasons following a large fire at the historic site. 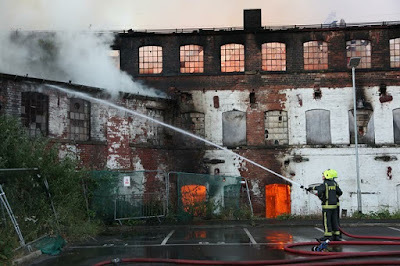 The former factory on the edge of Rotherham town centre was well alight when five fire crews arrived in the early hours of Sunday morning, July 1. The large premises are on Don Street between Rotherham Council's Riverside House and Rotherham United's New York Stadium. A spokesperson for Rotherham Council and Rotherham United, said this week: "Following initial advice from Historic England, an independent structural engineer has been consulted and has concluded that a section of the Guest and Chrimes building requires immediate demolition for safety reasons. "Due to concerns over public access to the site, demolition to part of the frontage of the building will begin on Thursday 19th July. Following this initial work, and in view of the building's historical importance, a further assessment will be made on the last section of the frontage which contains both the main entrance and the most interesting architectural features." Don Street, which passes between the building and the River Don, is used by fans accessing the family stand and away stand at the AESSEAL New York Stadium. The Millers kick of their home campaign back in The Championship on August 11 with home friendly against Premier league Cardiff City scheduled for July 25. The town centre masterplan outlined an aim for Guest & Chrimes to create a focus for recreation and sporting activity in the town. It concluded that "it is recognised by all that change and some demolition will be necessary to deliver a viable and deliverable scheme."